How could a foodie pass up this wine? I know I could not. The words “kitchen sink” relate to so many things. One is that I find myself at the kitchen sink all the time. Darn those dirty dishes. My wine rack is beside my kitchen sink. I cook things with the “everything but the kitchen sink” philosophy (clean out the refrigerator times). Even the label features a cool faucet. Everything about it made me want to taste it. 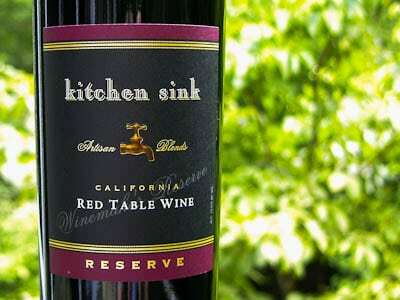 I do enjoy a good red wine blend. The complexity a blend can offer goes beyond those wines from a single grape. Plus it is great when I cannot make up my mind about which wine I want. It also is a wonderful thing to take a blend somewhere when you have no clue about what food is being served. The wine is smooth and full of flavor. Dark fruit and a hint of mocha are there from start to finish. Blueberry, blackberry, and cassis are the leading fruits. I made a brisket for the July 4th holiday and the wine went with it wonderfully. I finished the bottle the next evening and it held up overnight very well. Would I recommend and purchase this wine again? Absolutely. It retails around $13 (I purchased it for $12.99). It just makes it into my everyday wine price category. What wine have you run across that you had to buy? Was it the label, region, variety, or simply that it captured your eye? Wine shopping is so much fun. Tasting is even better. Be adventurous. You never know when you will find your next favorite. Cheers! Troublemaker by Austin Hope. Red label, the name of course. It’s a red blend. Yum! I need to find “Troublemaker” – sounds great. Texas Lime Wine from Salado Creek Winery. It is SO amazing! Thanks Jen! I’ll add that wine to my shopping list. Thanks for letting us know about this wine! This Wineaux can’t wait to try it! Thank you! I hope the next 2 years passes quickly for you so you can do wine reviews.